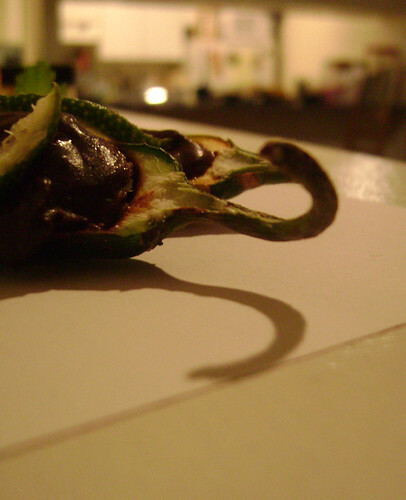 Jalapeno Chocolate, originally uploaded by Ayala Moriel. First batch was flavoured with lime and spearmint essential oils. Some of it I've stuffed into those green hot peppers (these are actually not jalapenos, because I couldn't find small enough jalapenos. Instead, I've used the hotter than fire serano peppers... Ouch!). They are topped with very thinly sliced fresh and sweet lime. If you're like me (meaning: don't mind some spiciness but don't seek the fire-hot sensation on your tongue), you may not want to bite into the pepper itself (unless you belong to the other kind of people). You may just want to scoop out the chocolate. After chilling in the fridge for several hours, the chocolate have absorbed enough hotness to satisfy me. The strange (in a good way) thing is: this combination, along with the pepper, tastes a lot like fig! I don't know why, but it certainly does. The second batch was where the real surprise was. This is the first time I'm making truffles with no perfume inspiration behind them, yet the result was immensely perfumey! Some kind of mysterious alchemy is going on there. The nutmeg I've used is nutmeg absolute, which is well-rounded and full bodied, smoother and sweeter than the nutmeg essential oil. The lavender is lavender Mailette from France, which is very floral and light. The two notes, along with chocolate, clash to create a very peculiar flavour that feels so familiar... I'm transported to the Wadi where my friend Zohar used to live, yet I can't say if it's her house that I'm smelling or if its a particular wild herb that I can't recognize, in the midst of the wadi... Either way, I'm enjoying these immensely. They are floral, exotic, unusual, strange, yet the flavour is very harmonious. I can't believe I'm saying it, but think these are my favourite truffles so far!